Happy Lunar/Astrological New Year! On Monday, 27 March, the New Moon in Aries ushers in a spanking new series of lunar cycles, giving us all a wonderful opportunity to set our intentions, clarify our goals and work with Universal energies to turn them into reality. Numerologically speaking, 2017 vibrates to the energies of Number 1. It’s the Year of Intention, folks – so let’s make the most of this New Moon to blast off! Plucky Aries is the first sign of the zodiac and known for its guts, impulsivity and willingness to start new initiatives. This week is a great time to set our sights on what we want to achieve, then act. And, as the line goes, May the odds be ever in your favour! There’s a bit of a Hunger Games theme going on in This Week’s Tarot as well. By this, I mean that you might find yourself in situations where there’s a certain sharpness (almost ruthlessness) in the way the people around you are working to meet their objectives. Whether or not you want to be a part of these energies is your choice – bear in mind we reap karma for whatever decisions we make in life. No fear, my darlings, just be clear about your intentions and they’ll light the way even in darker times. MIDDLE: EIGHT OF SWORDS REVERSED. This card portrays a young woman, blindfolded, tied, and made to stand within a circle of Swords. Upright, it is associated with powerlessness, almost a sense of being browbeaten or intimidated into submission. Upside-down, however, and the unequal power dynamics of this situation are ripe for change. It is possible to take back some control in this dysfunctional situation. How so? It is possible to take back some control in this dysfunctional situation. 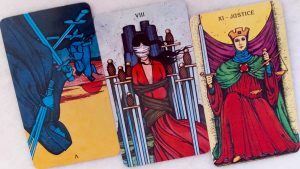 RIGHT: FIVE OF SWORDS. The challenge with taking back control in difficult situations arises when you realise you’re dealing with people who are deliberately being jerks. This is the card of dishonour, and the parties involved are not interested in playing fair. You really only have two options: play their game and reap crappy karma for yourself, or walk away and detach from the situation as much as possible. It’s also time to reflect: are you one of the misbehaving parties yourself? Are you beginning to suspect that someone who claims to have your back is not to be trusted? Whatever it is, keep your eyes open and your spirit discerning. Don’t be fooled – the Tarot Fives usually indicate that what you see is not what you get. There’s more to the situation than meets the eye.